Bespoke picture framing or custom picture framing is the answer when you want to make the best of your artwork, photos, prints, posters or canvases. Picture frames in classical, period or modern styles, picture frame mouldings in natural, gilded, painted, laminated, metal and many other picture frame finishes - you choose. Using our custom picture framing and bespoke framing service you can have bespoke framing, to any size, in thousands of mouldings, hundreds of mountboard colours and a choice of glass. For your special artwork, our picture framing is carried out using acid-free paper, to ensure that your artwork will always look stunning inside its frame. We specialise in modern bespoke framing techniques and experts in shadowbox, conservation, restoration, hand-finished and specialty framing. 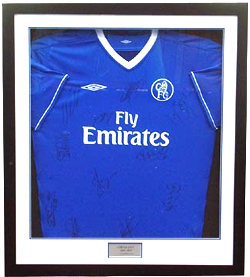 Our specialities include sports memorabilia framing, sport shirt framing, and display cases. Understanding the needs of our corporate clients has also made us a popular bespoke framing choice for many London and UK business. If you are unsure of what will be the most suitable frame for your precious item, we will provide expert guidance to suit your tastes and budget. We provide an individual service tailored to each customer.